Sharp is gearing up for 2014 with an entire lineup of new HDTVs—four series to be exact, each fitting into specific tiers for consumers satisfaction. What TV interests you will depend entirely on your budget. Money is no object? Sharp’s new TV lineup is being headlined by its AQUOS Quattron+ Series, which is a 70-inch class screen size that beams 4K content into your living room. There are more consumer-friendly models, too, starting at $1,499 , such as its AQUOS HD LE650 Series. There are many more, so sit back and relax. New to Sharp’s family of TVs is its Quattron+, which the company says offers the highest resolution of any HDTVs available. Not only can it playback 4K content, but it has built-in upscaling, with technology that’s capable of “dividing” the pixels on your screen, “effectively creating two pixels from one,” Sharp said. There are 16 million sub pixels in Sharp’s Q+ family (10 million more than traditional HDTVs), allowing for a billion more shades of color; Sharp claims this technology will allow for the sharpest possible picture. Sharp’s technology—it’s being called Revelation—is designed to be “future proof.” Not only does it natively play 4K content, but the Q+ comes equipped with four HDMI inputs and is compatible with 4K signals, so all your future 4K sources will have no problem beaming content into your new Sharp TV. 4K was never intended to be technology for the present, but something to look forward to down the road. Sharp is just ensuring that if you become an early adopter, you’ll be covered if you purchase its new Q+. Initially, Sharp’s Q+ TVs will be offered in the SQ15 and UQ17 series; the UQ17 series will offer three different sizes (60-inch, 70-inch and 80-inch classes), and sport AquoMotion 960, THX and THX 4K certification, 15W sub-woofer with Bluetooth audio, and SuperBright tech, which Sharp describes as “an intelligent contrast engine that creates brighter light colors and richer dark colors,” and also a more energy-efficient picture. The SQ15, on the other hand, includes a re-designed SmartCentral platform—SmartCentral integrates your cable channel guide and streaming services into a single interface. 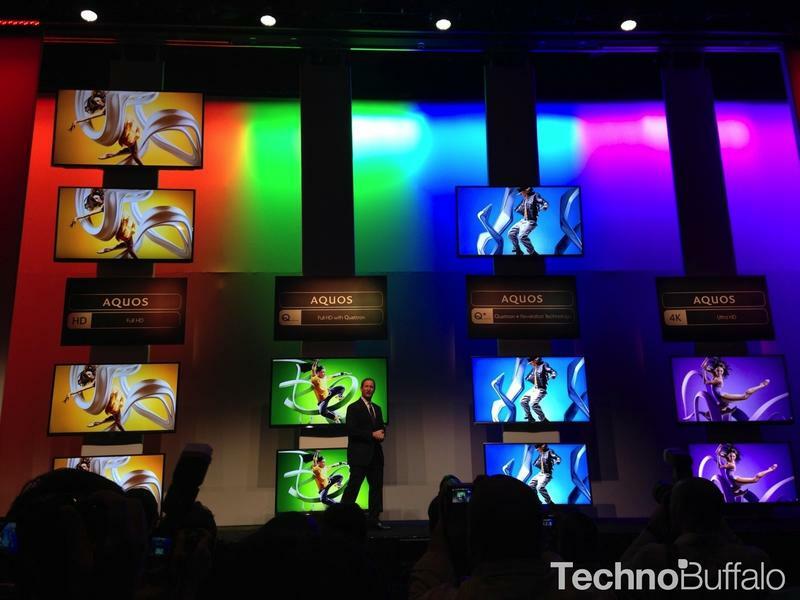 While Sharp’s SQ15 and UQ17 series are the company’s flagships at CES, the company will offer a total of 16 AQUOS LED TVs that are at least 60 inches or larger; there’s even one that is in the 90-inch class, which spans over six feet across. In the 70-inch class, Sharp will offer an AQUOS 4K Ultra HD UD Series (starting at $6,499), sporting that new SmartCentral technology, AquoMotion, Active 3D, THX certification and the ability to playback 4K Ultra HD 2160p content. Other series include a Quattron EQ Series, and an AQUOS HD LE650, which I already mentioned. The latter two are much more affordable than Sharp’s flagship Series, though you’ll still be paying a pretty substantial amount to experience the company’s bright new TV future. All HD, Q and Q+ models to begin hitting retailers across the U.S. beginning spring 2014.